Perennial. Zone 4. Caryophyllaceae. Syn. Melandrium rubrum; syn. Lychnis dioica. (Both names are now obsolete.) The green-leaved Silene dioica, Rosy Campion, is a common European wildflower which has been grown in gardens for centuries. There are numerous cultivars, of which ‘Ray’s Golden’ is one of the most recent, and notable because of its ease of cultivation and trueness from seed. 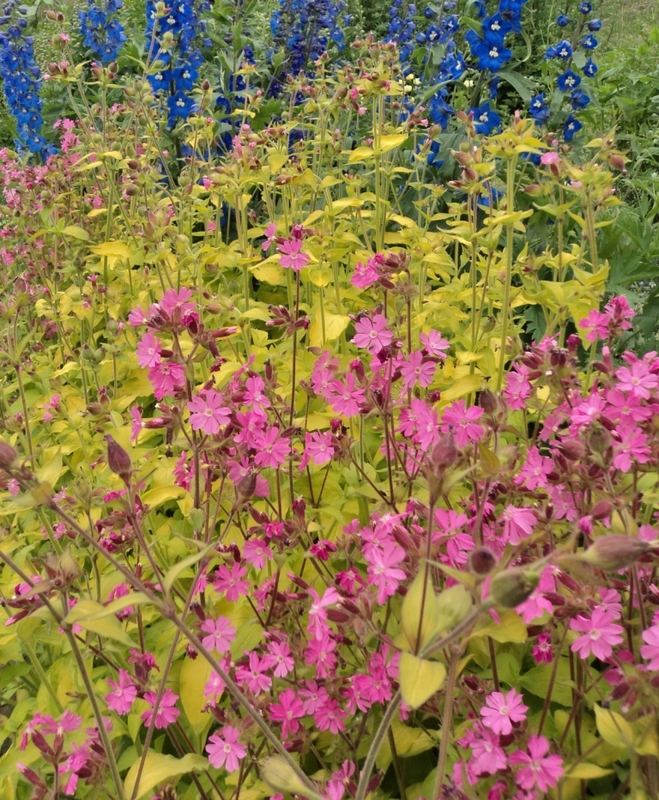 This is one of those garden colour combinations which really shouldn’t work – shocking pink with chartreuse – but it does, and extremely well, too. 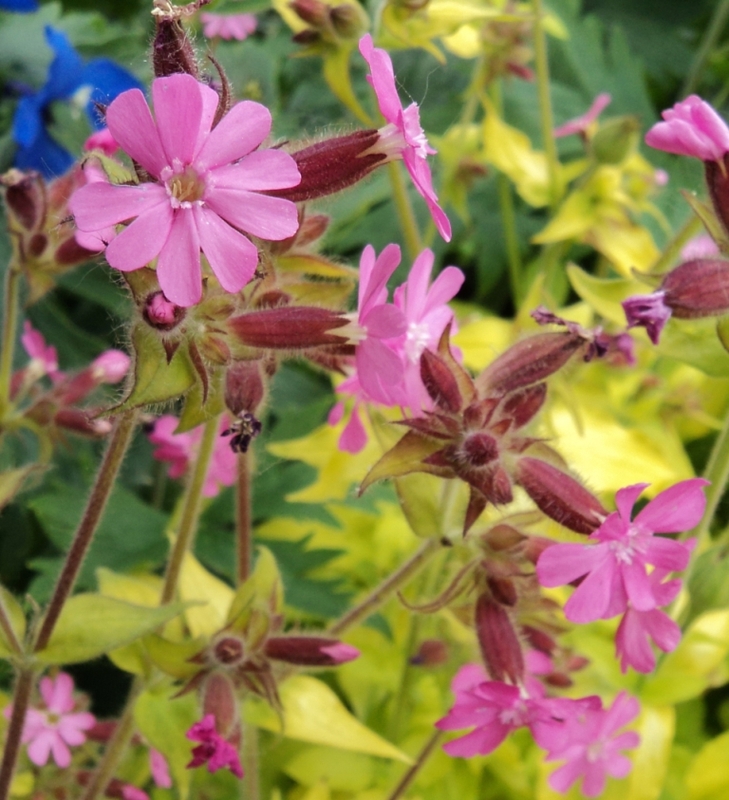 ‘Ray’s Golden Campion’ is a recent introduction from English nurseryman Ray Brown at Plant World in Devon, who painstakingly stabilized this sport of the well-known Rosy Campion. When I received my packet of seed, I was warned to rogue out any green-leaved seedlings which appeared; this was tremendously easy to do, as the gold-foliaged seedlings were immediately conspicuous from the first unfolding of their cotyledons. The first season the plants formed lush rosettes; the striking foliage colour remained true all summer. By late spring of the second year bloom stems appeared. I was very pleased to note that these were flushed with a contrasting red tint, as were the buds, which popped open into pretty, white-eyed, hot pink flowers in mid June. They bloomed and bloomed and bloomed, right through July, subsiding at last in mid August, when they started to mature seed in tiny, bottle-shaped capsules. A few of the plants in my test row succumbed to their second winter, but most soldiered on. Self sown seedlings were mostly gold-leaved, and the population sustained itself quite nicely up in the “delphinium jungle” of my neglected growing-out garden. After the second year I did not bother rogueing out the green seedlings, and now, five years later, much of the stand has reverted to green foliage. Still very pretty – Rosy Campion is a nice cottage garden flower even in its “unimproved” state – but not nearly as eye-popping as the original planting. This is a mid-sized sort of plant. Foliage rosettes are about a foot in diameter; bloom stalks are 12 inches or so tall when they first bloom, elongating to 18 inches by mid-summer. Nice in a foreground planting. These combine beautifully with delphiniums; the pink and gold of the Silene contrasting beautifully with any of the delphinium blues. This plant appreciates full sun. It is not fussy as to soil, and, though it flourishes most lavishly with regular summer watering, it has proven itself quite drought tolerant, surviving and blooming for most of the summer among the grasses which have taken over the neglected sections of the nursery garden.